Thanks to everyone for their great comments on our costumes this year! It's definitely been a great Halloween season thus far and I can't wait to make another homemade costume for next year. In the meantime, in case you're wondering how we put these together - here's a quick DIY rundown in case you want to get in touch with your own inner Muppet before this weekend's festivities. 2. 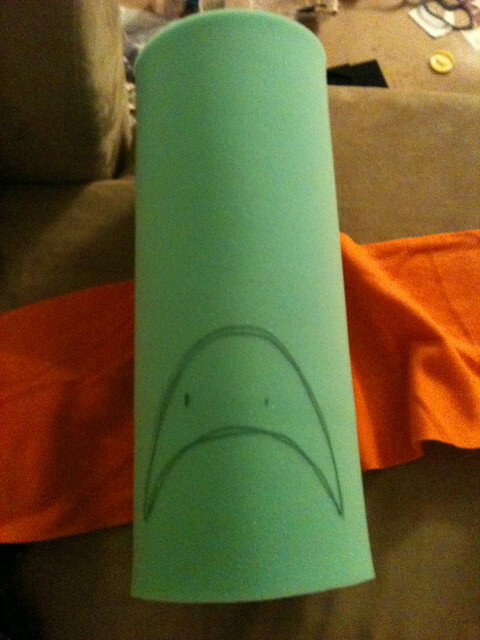 Once your foam is sewed into a cylinder, slide the mask on, stitched side facing the back/center of your head and have a friend help you mark the eye holes on the mask with a sharpie. 4. Carefully, slice the shape out of the foam using an x-acto knife (the foam should cut cleanly and quickly). 5. Using a glue gun, cover the cylinder in the flesh fabric. It helps to have a friend hold the fabric taught and to roll it the mask over the fabric to secure it. Tuck the extra fabric at the top into the cylinder and secure with hot glue. 6. Carefully, cut the fabric away that covers the mouth hole. Carefully hot glue the fabric beneath the mask to it makes a clean seam around the mouth. 7. Cut the black mesh to fit behind the mouth and secure it with hot glue. 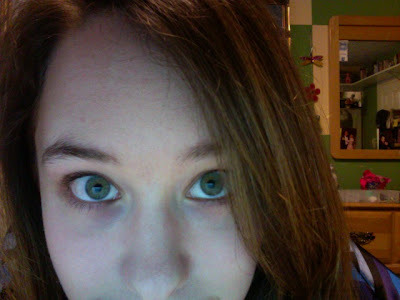 If you can't see through it yet, don't worry - you can slice holes in it to see better and no one will be able to tell. 8. 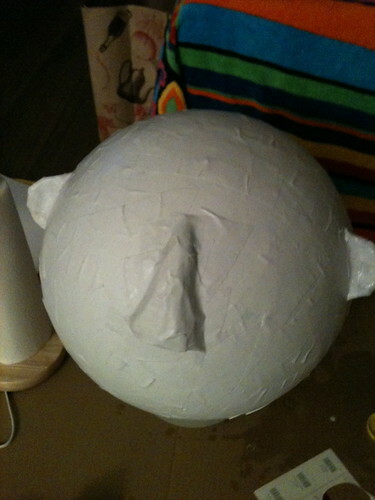 For the nose, cover the large styrofoam with orange fleece (using hot glue). 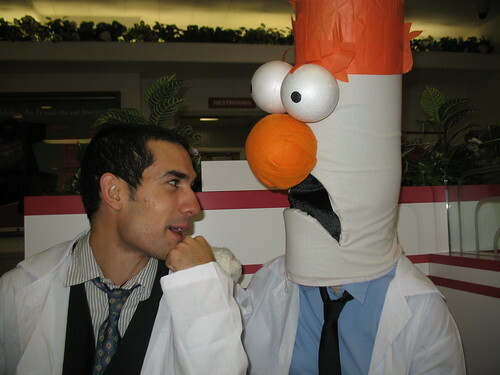 When it's covered, secure it with hot glue above Beaker's mouth area. 9. For the eyes, use a sharpie to add the eyeballs to the smaller styrofoam balls. Secure the eyes with hot glue directly above his nose. 10. For the hair, cut a zig zag pattern into layers of tissue paper and affix using hot glue at various lengths. 11. Complete your outfit with the body materials and you're ready to meep meep meep! 1. Begin by setting the bouncy ball on a bowl covered in plastic wrap. The plastic wrap will hold the ball in place for you. 2. Mix modge podge with a bit of water in the shallow dish covered in plastic wrap. Dip pieces of torn white paper (both sides) into the modge podge, slide it against the side of the dish to drain excess, and place on ball. 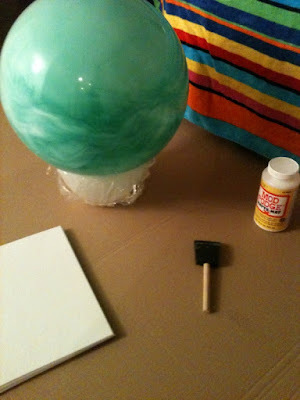 Cover the entire ball with pieces and make sure to get at least two layers of paper on it. Let dry. 3. 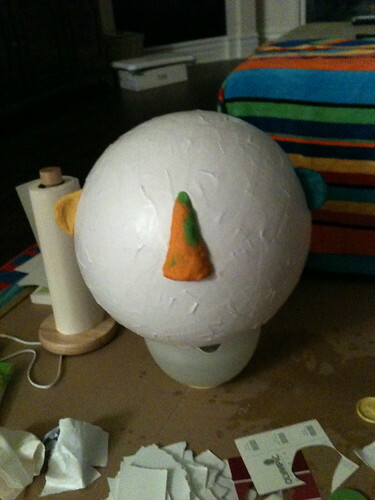 Once dry, use play dough to shape Bunsen's nose and ears. Cover all the new pieces with modge podge and allow to dry. 4. When dry, paint the entire mask with green paint. Let dry. 5. Cut glasses frames and glasses sides from the black stiffened felt. (It helps to fold the felt in half to cut even frames, then stick it under something heavy to make it lay flat again). Attach to mask using a hot glue gun. 7. 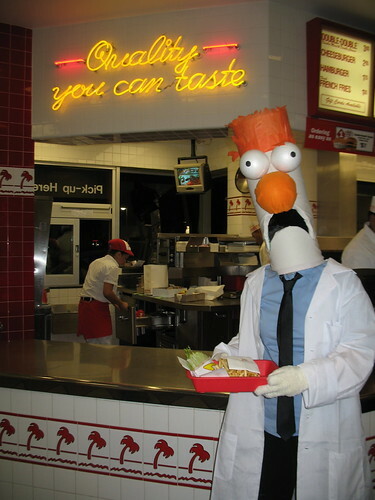 Draw the shape of Bunsen's mouth then, using an x-acto knife, carefully cut through the paper mache and make sure not to cave in the mask itself. 8. 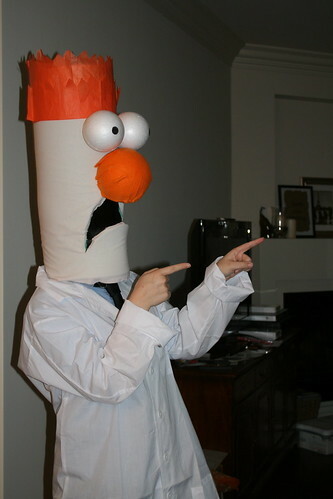 Similar to the Beaker mask, attach black mesh to the inside of the mouth with a hot glue gun. 9. Pair with your body materials and you're ready for the lab! 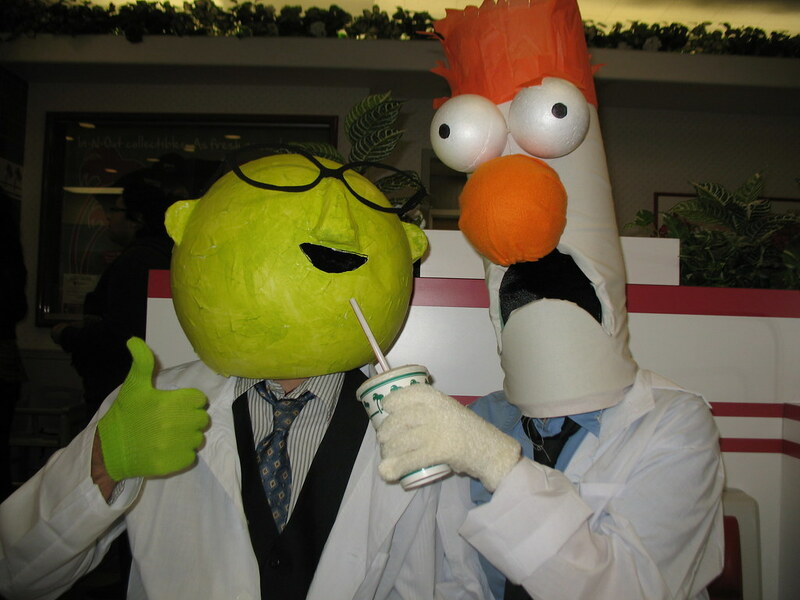 Bunsen Honeydew and his loyal assistant Beaker! As you know, I'm a giant Muppet nut and I actually got this idea for a couples costume shortly after last Halloween. 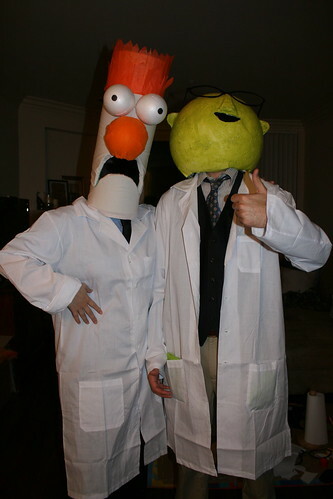 It's completely hand-made (aside from the lab coats - thanks Party City). 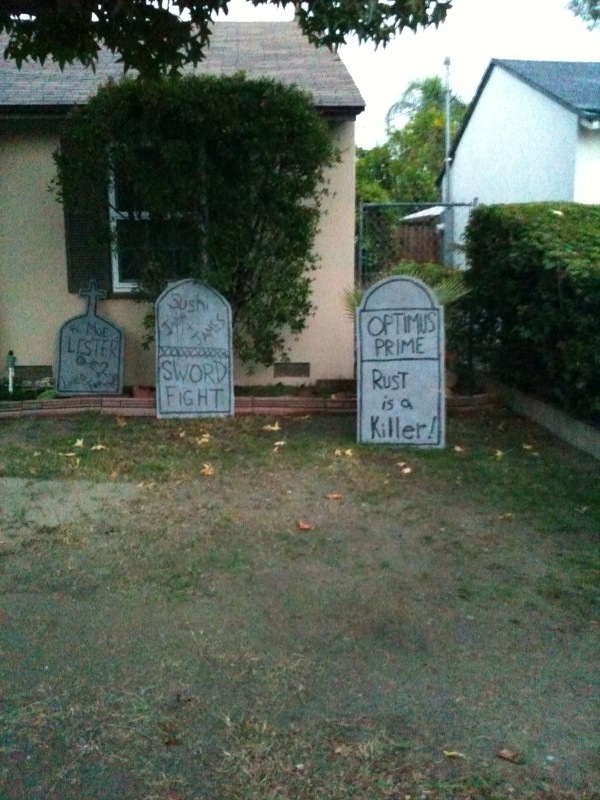 I had a very understanding roommate and very supportive boyfriend to help this costume come to reality. We went to our first Halloween party this past weekend and followed it up by going to a California institution - In N Out! 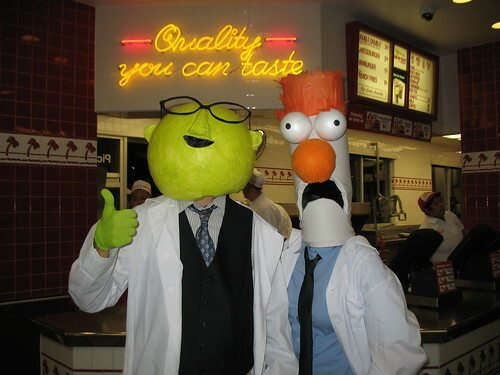 Needless to saying, going as Beaker to In N Out is definitely one of the most fun experience I've ever had out here - definitely the most fun I've ever had in a fast food joint. 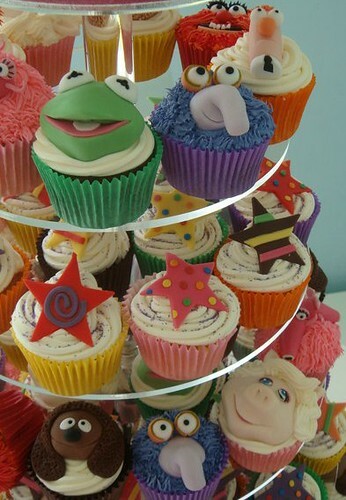 I'll post a DIY post later this week on how you too can get in touch with your inner Muppet by making these costumes with simple stuff - foam, paper mache, paint, etc. Stay tuned and til then - happy costume prepping to you and early Happy Halloween! 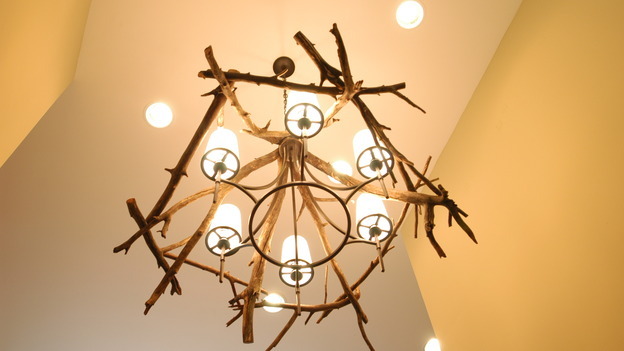 Linking up to the DIY Show Off! 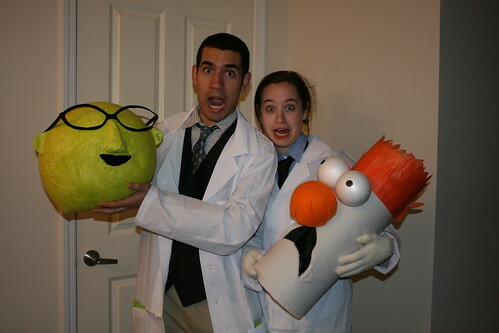 Gus and I have already had numerous adventures in this year's COUPLES Halloween costumes! For that reason, I'll do the big reveal TOMORROW! 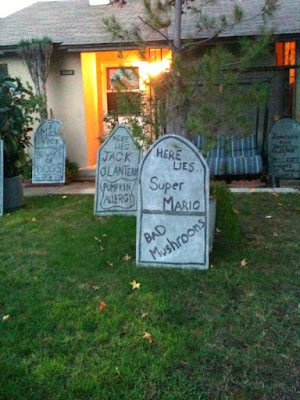 Stop by to see Halloween 2010 awesomeness. For now, here's another sneaky preview pic! I hardly ever stop my car to take a second look at something I've driven past. 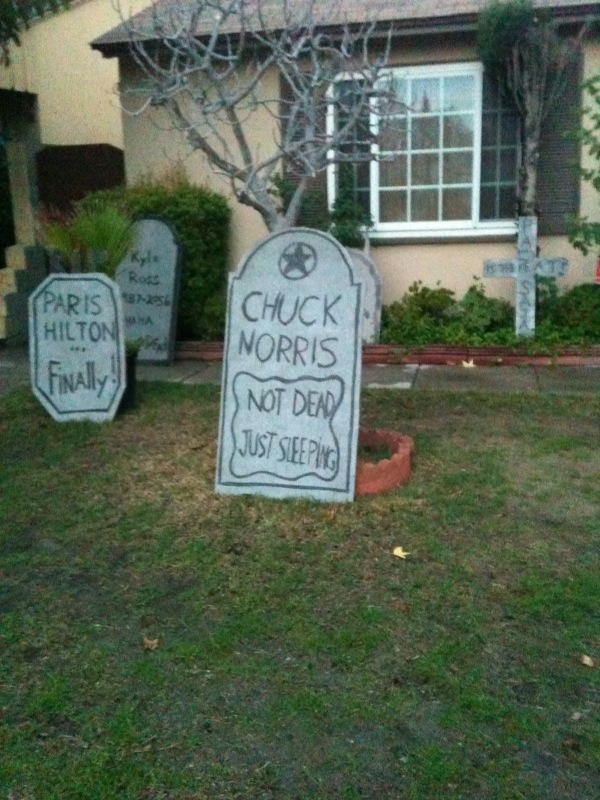 Last week, I simply had to after driving through a local neighborhood and spotting a home with some terrific Halloween DIY-ingenuity. As you have probably noted by now, I'm trying to do a lot of gluten-free cooking and baking as my sweetheart has developed an allergy to gluten (i.e. 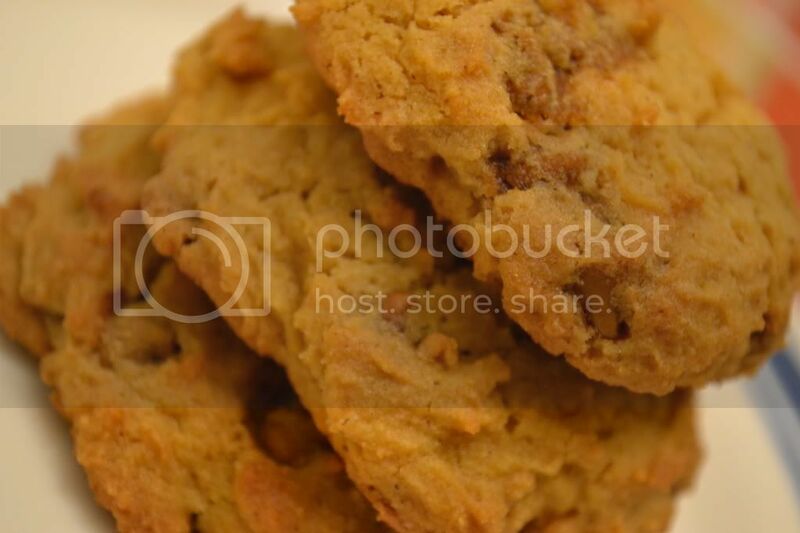 wheat) so all delicious things made with wheat flour are off the table. I'm starting to get relatively good at making meals but the big challenge with gluten-free cooking is getting things to taste "chewy." Gluten basically provides that in things like bread, cake, muffins, and it's pretty hard to replicate if you haven't practiced and aren't using the right ingredients. Gus and I recently got a major yen for apple pie and I decided I was up for the challenge. 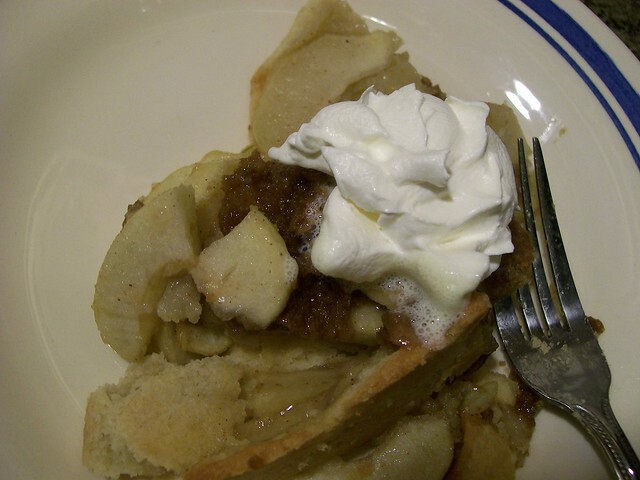 So we googled, and huzzah, made a delicious gluten-free Apple Pie with a crust that tasted like a sugar cookie! I urge you to make this, even if you and wheat are BFF. You'll love it. In a mixing bowl stir together the flour, xanthan gum and cornstarch. Then add the sugar, butter, egg and vanilla and mix until combined. Remove dough from bowl and knead and fold on a surface dusted with GF flour until well well combined. Divide into two pieces and wrap in plastic wrap, place one in the refrigerator to chill and place the other in the freezer for later use. 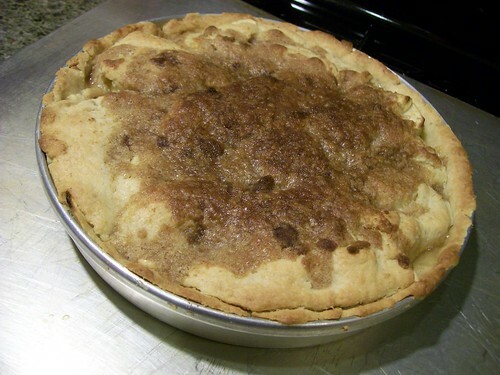 --Go ahead and make Apple Filling while the Pastry Crust is chilling. After approx 20 minutes, remove dough from refrigerator and roll into a ball. 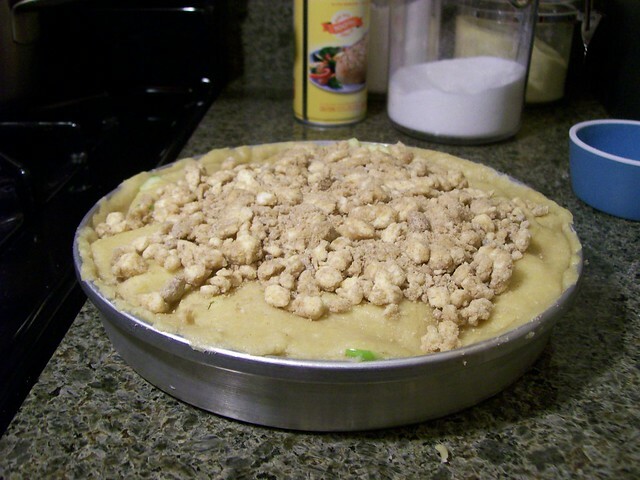 Using a rolling pin, roll the dough out on a lightly GF floured surface until it is the thickness of a normal pie crust. Place crust in a 9 inch glass pie dish that is lightly sprayed with non stick spray. Using a fork poke a bunch of holes in the sides and bottom of the crust. In a large bowl mix apples, sugar, cinnamon, pumpkin pie spice and salt. Set aside and let the juices mix. 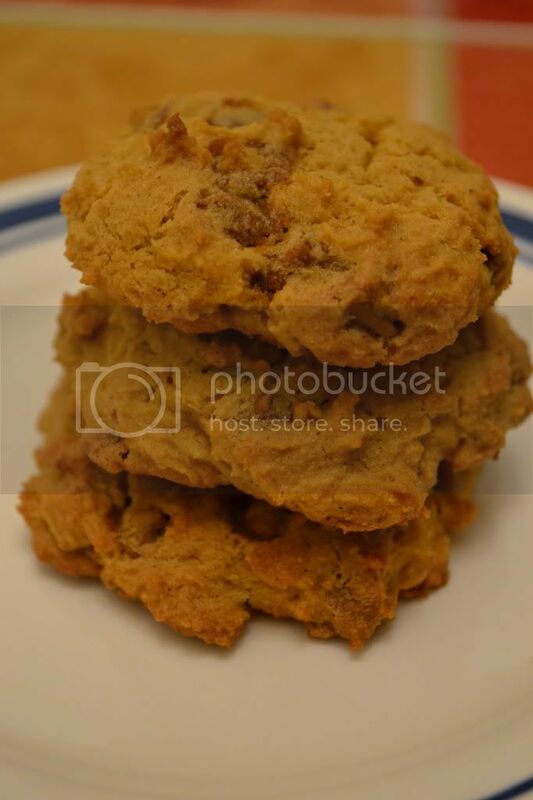 In small bowl mix together brown sugar, GF flour and cinnamon. Next mix in the chilled butter and cut it in with a fork or other tool until you have a course crumbly mixture. 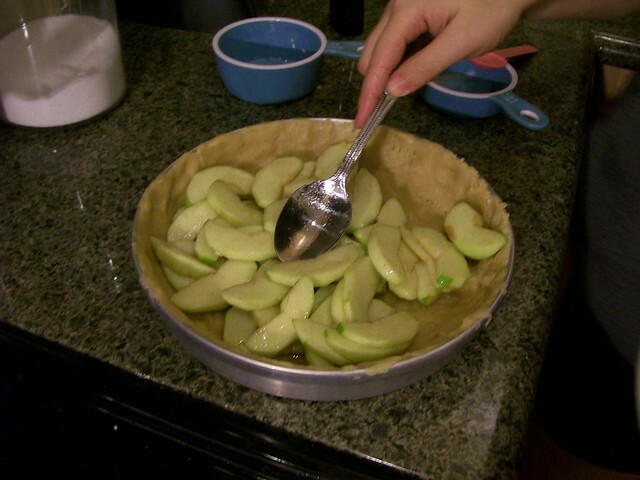 Spoon apples into your pie crust, mounding in the middle and pouring the sugary juices over top. Sprinkle your Crumble Topping all over the top (use it all). Use tin foil to cover edges of crust as it will burn easily. Bake for approximately 35 minutes, topping will be lightly browned and filling will be bubbly. Let cool for at least an hour before serving. I was giving a friend advice recently about where to find great baby info on the web and realize that I oddly knew of a ton of sites to send her in the direction of - ohdeedoh.com, younghouselove.com, etc. Where did I, 25 year-old with no babies aside from her Pook-a-Looz of Kermit and Fozzie, become a semi-expert on some things? Strange the things that blogging will teach you. Today, I'm happy to show off a great nursery makeover on the blog. These photos are from my friend Erin's nursery. We met in my old position for Disney Feature Animation. Without further adieu, her nursery for her gorgeous baby Alice is below. Hope you enjoy- I was totally inspired!! For more info on Erin's incredible giraffe-inspired transformation, head over to her blog - Growing up Senge. love the simplicity of the name art. totally gorgeous. Say it with me everyone - Move.. that.. BUS! Okay, sorry, no bus here to move but did recently discover that along with all the amazing good the show, Extreme Home Makeover does on a regular basis, they're also doing the humble DIY'er good too! 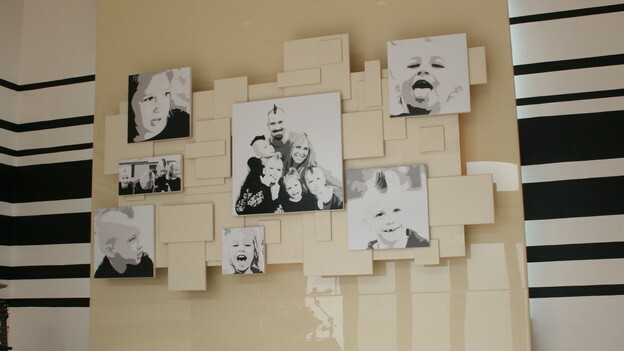 Apparently they have a huge gallery of DIY projects from their episodes for you to make in your own home. While some may not tickle your fancy and others don't have extremely detailed instructions, the inspiration alone is worth pointing this online gem out to you guys. Here's the main link and below are a few of my favorite potential projects. Yes- this post is exactly what you think it is, you lovers of all things chocolate and wafer. My boss is a big fan of the red wrapped treat - KitKat. So much so, that I've stashed away his favorite treat, frozen as he prefers, and he often asks me to grab one for him when the day's just getting too stressful. His birthday is in about 10 days but he'll be away on a business trip then a vacation. Last Friday was our last opportunity to catch him for the big day and I figured what would be better to celebrate his love and celebrate my one year of blogging with a most delicious KIT KAT CAKE! With that my friends, here's how to make your own slice(s) of heaven. This cake was inspired by others I found on the web but hey, I love a great baking opportunity and wanted to pass it along to you. - 1 long white ribbon - at least 24"
1) Prepare to make and bake cake mix as directed. Divide batter into two Pam-greased 9" in round cake pans. 2) Bake cakes as directed on your cake mix packaging. 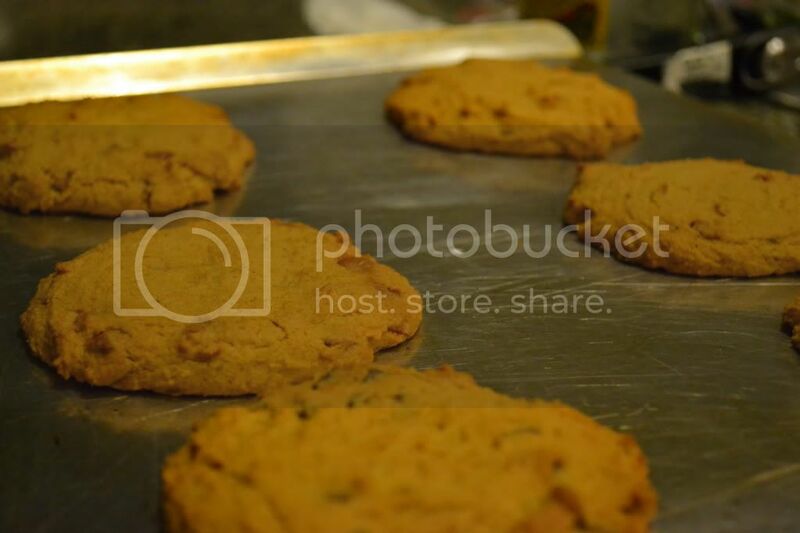 3) After the cakes have cooled, slide one layer onto a large plate. 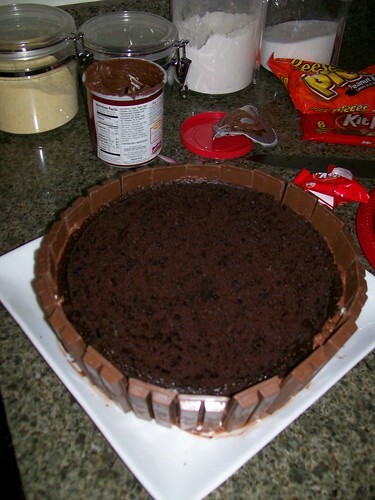 Use a serrated knife to even out the top of the cake if it rose while baking. 4) Top that first layer with approximately 1/3 a tub of cool whip. 5) Slide the second cake layer centered on top of the cool whip and first cake layer - forming a delicious cake sandwich. Yum! 6) Use the serrated knife again to level off this top layer- this will be your base for the 'barrel' insides where your candy lays. 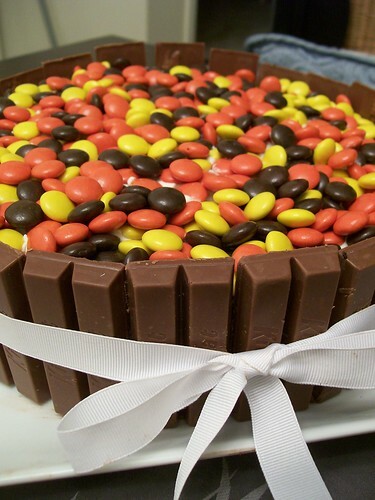 You'll want the cake layers to come up no higher than 2/3 the height of your kit kats. Feel free to open one to use it as a measure. 7) Once your cake sandwich is level, top the second layer with a thin spread of cool whip. 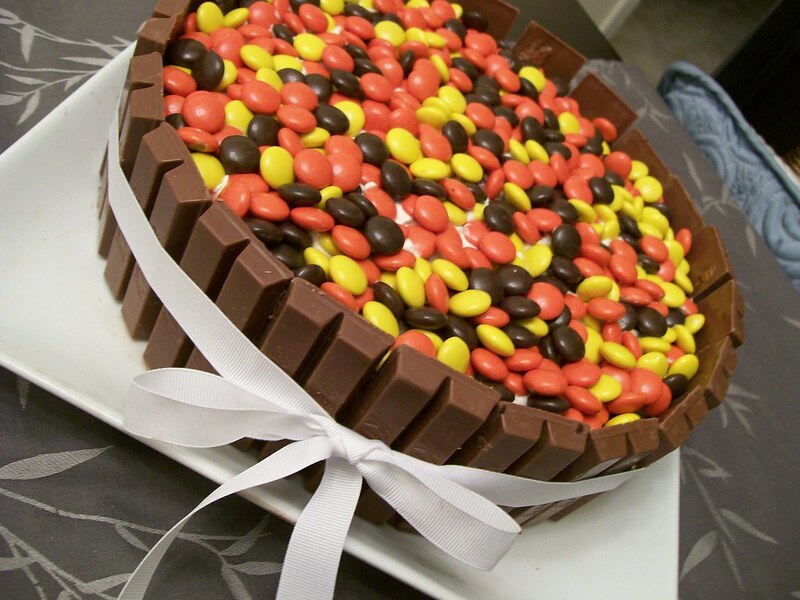 This will act as your glue, making sure that the candies stay somewhat on top of your cake when you slice into it. 8) Now, for the Kit Kat border! 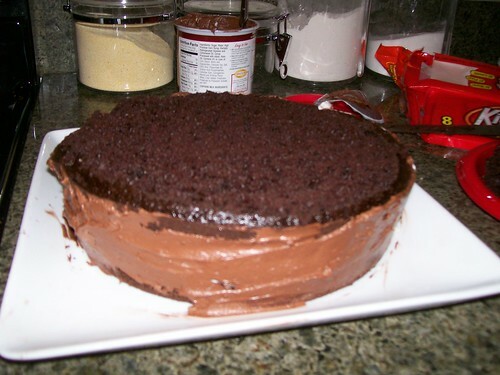 To "glue" your border to the edges of your cake, use a thin layer of chocolate frosting. 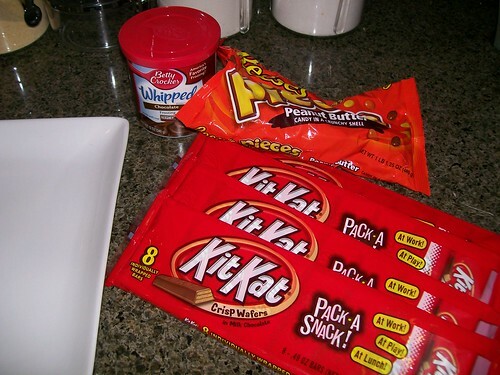 Then have a friend (in this case, my sweetheart) help you unwrap 24 kit kats! 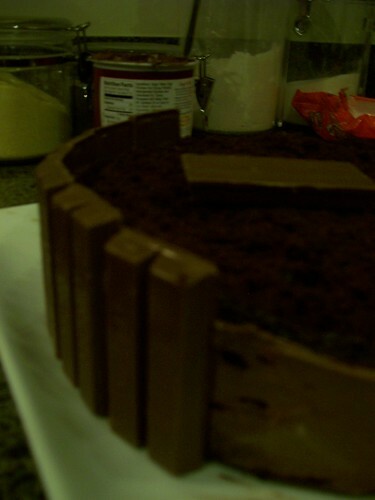 9) Attach the kit kats with the kit kat logo facing outward around the cake, using the frosting to help it stick to it. 10) Take your white ribbon (or whatever color ribbon you like) and run it around the middle of your cake - tying a secure but pretty bow at the front. This was the moment! I raced to the fridge and rounded up the office and presented him with 24 kit kats + a cake. Suffice it to say, it was momentous. And that's kinda how I feel returning to blogging. I've been stressed, distracted, pulled away by other interests and lots of new changes - but at the end of the day - well, end of this year- I've realized it's time for a kit kat. Time to cut lose. Time to get creative again. Glad to be back and thanks for all your support thus far - happy one year blogging anniversary to me! Tuesday, October 5 will be my one-year blogging anniversary! What better way to celebrate by getting back in the swing of writing regular posts? I've been up to so, so many things including a brand new apartment to decorate and lots of other exciting things to update you on. I'm pumped. I hope you are! Gus and I doing field research for work while at Disneyland. Not officially working, but I look to think analyzing the parks as I ride all the rides could potentially help my job. Thanks for your patience as I've stepped away from blogging for a few months to focus on my new job. As some of you know, I had been laid off, spent weeks looking, only to land in an even better, more exciting role with the same company (Disney). I have a few things in the can to share on the blog soon and will try to post something this holiday weekend or directly after. In the future, I doubt I'll be able to return to my 5-post a week schedule but I'm going to make more regular appearances here. Thanks for staying tuned- have a wonderful fourth of July everyone! I've been hard at work on my living room lately and after months and months of frames sitting in my closet, I finally broke out the hammer and nails! Here's the state of my lovely living room these days, complete with new Calvin Klein table runner ( a steal at $5 from Macy's) and artwork (above the desk) for $20 from Marshall's. Other than that, all other additions were stuff around the house, repurposed or hung up for the first time - hurrah! 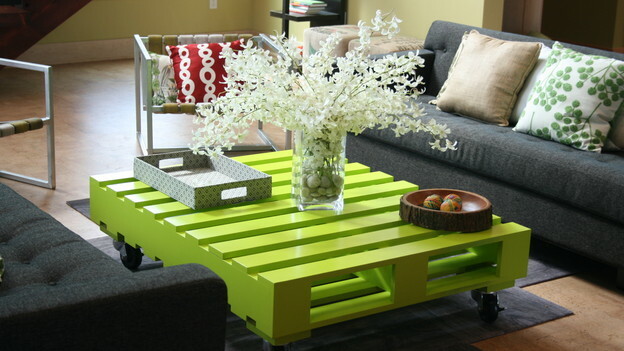 Interested in the evolution of the living room? Here's a few posts of what led to this point. I was a busy decorating bee this weekend. Here's a small sneak peek of what I've been up to in the living room. This is a table runner from Calvin Klein - originally $60 (are you kidding me?) - got it at Macy's for $5! Can't beat that. Stay tuned for a Friday reveal of serenity/my newly lovely living room. Check out more, here. Happy weekend!! Maybe it was good juju that I posted about looking for a job... as it turns out, I just got a new one! And it's pretty awesome, and I still work for Disney on top of it. Hope to be back in the swing of blogging soon. Thanks for your patience! Beautiful Prints for your home... alert: Young House Love's sponsoring a giveaway featuring a vendor called Vol. 25. I'm totally in love and you will be too - check out Vol. 25 by clicking here. Frustrated by a lack of cohesion with my living room, I've recently turned to a favorite source: Pottery Barn to solve my latest decorating dilemma. I have not been able to decide on any color scheme I truly love! For awhile, it was warm beige, black, white, with pops of red. Snore. I got tired very quickly. I've read that a great place to start for color inspiration is with a rug but I have yet to find a rug I'm truly in love with either (that doesn't cost an arm and a leg). I recently tried to shake things up for Spring in this post but it wasn't quite right. In pondering this question, I remembered that my bedspread in my bedroom is a print from the 'Barn and I've absolutely loved having it and working with the colors in it. I got to thinking that perhaps I found a print I loved for the living room, I could just use that to guide my color scheme for accessories, pillows, etc.